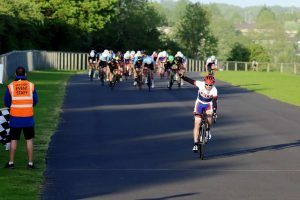 Latchem Sunwise won five out of the six E/1/2 rounds in the Odd Down Summer series last year, and started this year’s series in similar fashion with Luke Nolan taking the win from a break of four riders. He was joined in the break after 20 minutes racing by Bristol RC’s James Phillips, Tri UK’s George Smith and Bikestrong-KTM’s Paul Jones. The composition of the move left VCEquipe/FlixOralHygeine/Propulse as the only large team missing out, following Gareth Turner’s unsuccessful attempt to bridge soon after the break had formed. Their pursuit kept the leaders within reach, but the gap never looked like closing going into the final laps. Nolan was run close by Phillips in the sprint, but Latchem Sunwise’s joy was complete as Nathan Hallett also took the bunch sprint behind for fifth. The men’s 3/4 race looked to be heading towards a sprint finish, despite a number of attempted moves off the front of the 50-strong group. The only rider to get any room was VC Walcot’s serial attacker Stefan Barnett, but with Bath CC, Bristol RC and Bikestrong-KTM all showing numbers at the front of the bunch it was going to prove difficult to force clear. 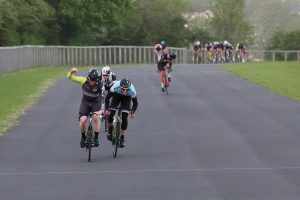 It looked as though the perfect move had gone with half the race done, featuring Duncan Lancashire (Bath CC), Christopher Hill (Bristol RC) and Daniel Carr (Salt and Sham CC). However, without a Bikestrong-KTM rider in there, it was a strong turn from their rider Rob Abraham that brought that move back into the fold after a few laps spent just in front of the main bunch. It was with only a few kilometres to go that the decisive move was made. With the main teams surging towards the front of the bunch, Lancashire managed to slingshot away going into the final couple of laps. All it took was a moment’s hesitation from the main group and he had an unassailable lead. Behind, the bunch sprint was taken by BPF Cycling’s Thomas Hogan ahead of Patrick Henry of Bristol RC. Those results put James Phillips in prime position to take the lead in the overall series standings, ahead of Lancashire and Jones; with the Latchem Sunwise riders stacked just behind them in fourth and fifth.